2012 ended with a whimper, not a bang, in my house. The world didn’t end (for those who planned for it, you have a lot of tinned food to get through and a bunker to spring clean), and the eating, drinking, xmas party fatigue gave way to slothful holiday behaviour. I did manage to pop one eyelid half open to note that the cherry farmers were banging on about the best cherry season EVER. Hard to ignore, particularly given cherries are a must on an Australian Christmas table, and weather conditions are so all over the shop we don’t know when we’ll see a season like it again. So, seize the day I did, or Boxing Day night to be more calendar precise. 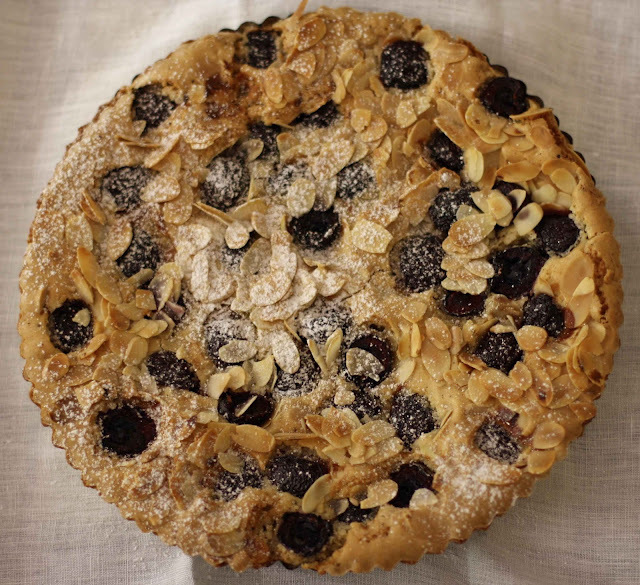 This Burnt Butter, Cherry and Almond Torte, went down a treat. According to Karen Martini, it’s just as delicious with raspberries, blackberries or figs, so you adapt it to what’s in season (fig torte in April perhaps?). This cherry-laden version is a fine end to a meal (beef fillet, stuffed onions, pumpkin and macadamia salad, and roast potatoes). *Not too sweet, though the next time I make it, I may leave out the almond essence. I felt it gave it a note of artificiality. One word of advice. Make it several hours in advance. A couple of stages of the recipe require you cool the ingredients to room temperature, which threw my timing. Happy 2013. I hope it’s marvellous for one and all. Preheat the oven to 160C if fan-forced, if conventional set it at 180C. Line a 24x5 cm fluted tin (with a loose base) with baking paper and spray with cooking spray. Melt butter in a small saucepan. Add the vanilla beans and seeds and cook over medium heat for 4-5 minutes or until the mixture darkens and smells nutty. Pour into a bowl and cool to room temperature. Remove some of the vanilla splinters and set aside for garnish. Whisk egg whites with a pinch of salt in a large bowl until soft peaks form. Add half the icing sugar and combine, then fold in the remaining icing sugar, flour and ground almonds. Stir through the burnt vanilla butter and almond essence. Pour mixture into the tin and scatter over almonds and cherries (reserving a few for garnish). Bake for 1 hour or until the tart is puffed and just set. Remove from oven and cool to room temperature, making sure to remove the fluted tin once it’s cool enough to touch (you can do this by placing it on an elevated base, and loosening the fluted part slowly and gently). Dust with icing sugar and garnish with reserved cherries and, if you like, vanilla-bean splinters. Serve with creme fraiche, and if you must, ice-cream!